The DX Pack was exclusive to Ebten and sold for 10,870 yens before tax. Vance (4 l. temu) #2564096Thanks for your reply :) The picture do have a Bandai Namco logo on right/down corner like the picture under. But i am still unsure :/ the cover is still a little different. Yes, because Bandai Namco (which I referred to as "Bamco") is the company behind this game. But it is primarily a Japanese company (even though they have subsidiaries throughout the world which later release the localised versions) so the game they will release on January will be in Japanese. No release info or cover is known yet for the localised versions that we will get in NA, Europe and other non-Japanese territories at some point later. Therefore what I meant is that unless Bamco clearly announced somewhere that the JP game will have English subtitles, don't expect that game on AmiAmi to have them. Furthermore, I am positive Bamco hasn't made such an announcement, since it has unfortunately never be the case for any previous Tales game. Hope this clarifies! Take (4 l. temu) #2563617Unfortunately unless Bamco advertised otherwise, I don't see any reason why it would have english sub, given the fact that it's the Japanese version of the game. Thanks for your reply :) The picture do have a Bandai Namco logo on right/down corner like the picture under. Vance (4 l. temu) #2563553Does the PS3 Tales of Zestiria sold at amiami have english sub? it doesnt say anything there. Unfortunately unless Bamco advertised otherwise, I don't see any reason why it would have english sub, given the fact that it's the Japanese version of the game. 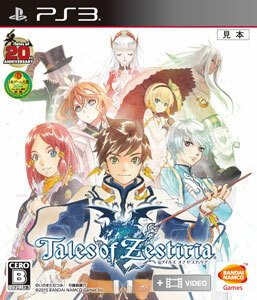 Does the PS3 Tales of Zestiria sold at amiami have english sub? it doesnt say anything there.